This is Austin’s longest running weekly hip-hop event. Cheap drinks, a great atmosphere, and amazing music thanks to local favorite DJ Mel. The Blanton Museum of Art invites you to see their newest exhibition, Exquisite Visions of Japan: Prints from the James A. Michener Collection of the Honolulu Academy of Arts, which opened on Sunday, June 29. These Japanese prints were not made on paper, but on woodblocks. It includes fifty prints from master Japanese printmakers, including Kitagawa Utamaro, Katsushika Hokusai, and Utagawa Hiroshige, and serves as an Eastern Counterpart to the Language of Prints exhibit. 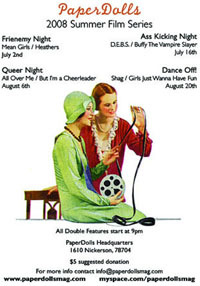 Launching August 1, PaperDolls is, according to their MySpace page, “an advertisement-free, Web-based, girl positive magazine that provides frank, multi-sided, and well-researched articles and interviews that are relevant and interesting to teenage girls.” So it’s fitting that their Summer Film Series is featuring movies about ladies. Tonight’s films are Mean Girls and Heathers. 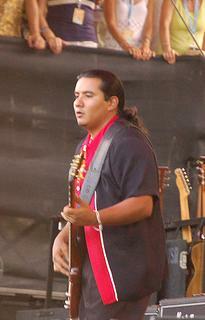 You’ve probably heard of Los Lonely Boys – their self-titled first album produced the chart-topper “Heaven,” which won a Grammy. You also probably cringed every time a radio DJ said “the Los Lonely Boys” instead of just “Los Lonely Boys.” They released their second album, Sacred, in 2006, and now Los Lonely Boys will be at Waterloo Records promoting their third album, Forgiven. 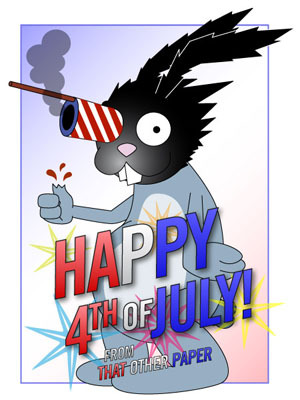 illustration / Aaron Stanush and Todd Ross Nienkerk Happy Independence Day! Apparently this is going to be the largest Independence Day celebration in Austin ever – over 100,000 people are expected to attend. Bring a blanket, water, and bug spray, and claim a spot in the park. The show will feature patriotic music (including the 1812 Overture punctuated by 75-millimeter Howitzer cannons) and fireworks over Lady Bird Lake. Talented LA rockers Rooney have been MIA for a while after touring for their self-titled first album, but they’re finally touring again to promote their second album, Calling the World. These guys have toured with Weezer, The Strokes, Sloan, The Sounds, The Donnas, Travis, Keane, and more, and they’re amazing live. Hot fact: Lead singer Robert Schwartzman is Jason Schwartzman’s little brother, and the nephew of Francis Ford Coppola; cousin of Nicolas Cage, Sofia Coppola, Roman Coppola and Christopher Coppola; and grandson of Carmine Coppola. He also set teenage girls’ hearts a-fluttering as Anne Hathaway’s love interest in The Princess Diaries (don’t hold that against him). Seussical – a FUNtastical, magical, musical extravaganza based on the books of Dr. Seuss – live on stage this summer! 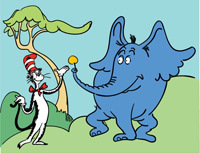 Your family will be enchanted when Seuss’ beloved characters spring to life in this energetic, heart-warming musical featuring classics such as Horton Hears a Who, Horton Hatches the Egg, Gertrude McFuzz, Green Eggs and Ham and of course, The Cat in the Hat! Dr. Seuss’ most colorful characters come tumbling right out of the books and up onto our stage in this joyful gumbo of musical styles, ranging from Latin to pop, swing to gospel, and R&B to funk! So let your toes tap, your fingers snap, and your imagination run wild! ZACH’s production features Austin’s most talented youth and adult performers in a full scale production guaranteed to delight your children, and make you feel like a kid all over again.